New deployments of optical fiber to commercial buildings and data centers continue to steadily climb. However, a minority of the 5+ million commercial buildings and data centers in the U.S. have active lit fiber connectivity to business network services. Also, a substantial disparity exists in fiber availability based on building size. Vertical Systems Group’s latest ENS Research Program research shows that 59.6% of Medium/Large buildings were fiber lit at the end of 2018, as compared to only 9.9% of Small Buildings. All remaining buildings are in the ‘Fiber Gap’, which is our term for sites without active fiber connectivity. Consequently, this gap extends to 40.4% and 90.1% of buildings in the Medium/Large and Small segments, respectively. The Medium/Large segment is defined to include buildings with twenty or more (20+) employees, and the Small Buildings segment includes buildings with fewer than twenty (<20) employees. These two segments combined cover the total U.S. business fiber landscape. As compared to the Medium/Large base, the Small Buildings segment has vastly more commercial buildings, a larger number of fiber lit buildings and an expansive Fiber Gap. Due to the disparities between these two segments, our research analyzes them independently as well as in aggregate for the total U.S. market. Some background on the origin of these two major segments is helpful. In 2004, our business fiber research was initiated with the benchmark statistic of 10.9% for U.S. buildings with 20+ employees. The driver was that a major inhibitor to customer adoption of the nascent Carrier Ethernet services market was lack of direct fiber connectivity to business customer sites. Specifically, the infrastructure to support the deployment of carrier-based native 10/100-Mbps Ethernet services was either not accessible – or available but too costly. New research was needed to quantify the number of buildings with fiber in the U.S. for input to our Ethernet market projection model. We decided on the threshold of medium to large buildings with 20+ employees because it mapped to the addressable market for business customers with purchase requirements for high speed wireline network services. Since then, fiber availability for the 20+ segment has steadily risen each year. It reached 54.8% in 2017, when the 20+ Fiber Gap dropped below fifty percent for the first time as more buildings were fiber lit than in any prior year. 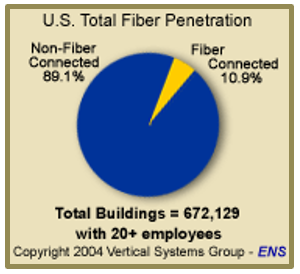 Our ENS analysis includes a granular view of penetration rates for the fiber-deep Medium/Large segment, with detailed statistics for four building sizes (i.e., 20 – 50, 51 – 100, 101 – 250, and 251+ employees). Optical fiber is now the optimal wireline access technology for the transport and delivery of Ethernet and other higher speed network services. In fact, the majority of currently installed U.S. retail Ethernet service ports are connected with direct optical fiber. In 2016, we broadened the ENS fiber research scope to encompass the total U.S. market with the addition of the Small Buildings (<20) segment. Lighting small buildings has become more profitable for service providers as a result of lower fiber deployment costs, coupled with rising demand for high speed services from smaller companies. Vertical’s Fiber LEADERBOARDs also cover a total U.S. view. Results for the 2018 U.S. Fiber Lit Buildings LEADERBOARD show the rank order of the top eleven retail and wholesale fiber providers with 10,000 or more on-net fiber lit commercial buildings. 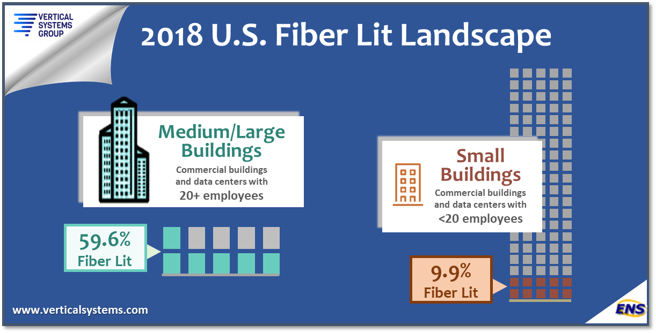 Additionally, thirteen fiber providers are cited in the 2018 Challenge Tier based on between 2,000 and 9,999 fiber lit buildings. The U.S. fiber market is sizable, growing, and bifurcated based on building size. Cable MSOs and regional network operators have been most actively targeting fiber investment opportunities in the underserved Small Buildings segment. Accelerated deployments of new active fiber are expected to continue through 2019 based on the plans of leading fiber providers. Deployments of lit and dark fiber are increasing for mobile traffic aggregation, and 5G rollouts. M&A activity will continue to impact the Fiber LEADERBOARD roster. Rosemary Cochran is a Principal and Co-Founder of Vertical Systems Group.